In October we opened a new office in Wroclaw. This new location in the south of Poland will strengthen our partnerships with architects, general contractors and real estate investors in the region. 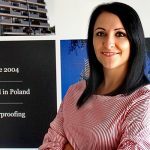 “Opening an office in Wroclaw in addition to our presence in Warsaw, allows us to be close to our customers for new roof construction as well as for roof renovation”, said Magdalena Koper, Business Development Manager for Tectum Group Poland. Due to the emerging industry, the region holds enormous potential. Also, a local presence gives us the right edge to really assert ourselves as roofing experts in Poland.